The role of women in the food industry has seen an exponential growth in recent years that can be attributed to the groundbreaking female chefs that have paved the way in decades past. Many of these pioneering women are affiliated with the philanthropic organization for women, Les Dames D'Escoffier. The organization aims to help open up the world of food and hospitality to women, who for many years were rarely found in the professional kitchen. Today, Les Dames D'Escoffier boasts over 1400 invitation-only members in 27 chapters around the world. Join Friday Arts as we attend the Philadelphia chapter's first symposium featuring hands-on cooking classes and panel discussions with influential "dames" such as four-time James Beard award winner Rozanne Gold. We speak with our local "Top Chef" contestant Jennifer Carroll and food writer Toni Tipton-Martin, demonstrating the diversity of careers women can hold in the food industry today. 2 pounds Swiss chard, stemmed and washed in several changes of water, stems diced and set aside. Fill a bowl with ice water. Bring a large pot of generously saled water to a boil and add the chard. Cook for 1 to 2 minutes, until just tender. Transfer to the bowl of ice water and let sit for a few minutes. Drain and squeeze out as much water as you can. Chop coarsely. Heat the olive oil over medium heat in a large, heavy nonstick skillet. Add the chard stems and cook 3 to 5 minutes, until tender. Add the garlic and cook, stirring, about 1 minute or just until the garlic begins to smell fragrant. 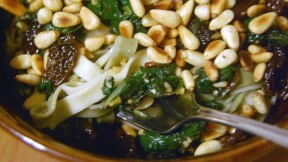 Add the chopped greens, pine nuts and raisins and toss together until they are well coated with oil and heated through. Season to taste with salt and pepper.